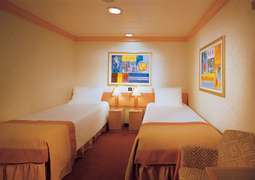 The Carnival Valor offers many different cabin categories with a unique “Ancient Heros” design. 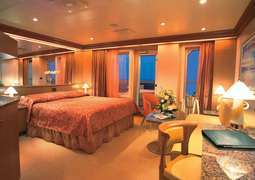 Feel free to choose between inner, outer and balcony cabins and luxury suites. Enjoy the feeling of a home away from home on the high seas. 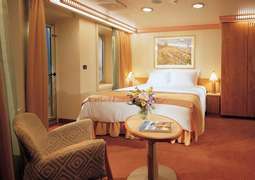 A 24-hour room service is also provided. A wide variety of fine cuisine ensures something delicious for all taste preferences. Dine in the elegant atmosphere of the Á la Carte Restaurant or go for a tasty snack in the Bistro. Take advantage of the 24-hour pizzeria to cure cases of the late-night munchies, or enjoy lighter fare in the sushi bar or from the offerings of the 'Spa Carnival Menus'. On board you will always be well entertained. Diverse clubs, bars and lounges offer variety every evening. Enjoy spectacular, Las Vegas-style and live bands, or show off your own musical talents in front of an audience in the karaoke bar. The Club 02 provides entertainment for teens and the Camp Carnival is the perfect place for younger guests to play. The Carnival Valor offers a well-equipped fitness centre and a variety of fitness courses to help you keep active during your holiday. The spa area provides relaxation with a sauna, steam bath and massage and beauty treatments.